to become the den of cutthroats and outlaws. that had long lay on the seabed. the air and then it burst. 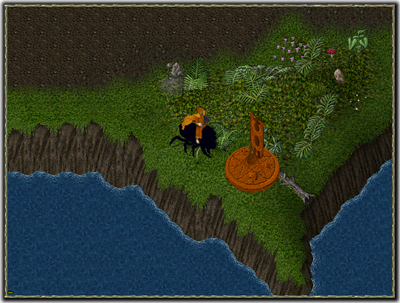 it conceals an enemy ready to kill: at....Buccaneer'd Den! 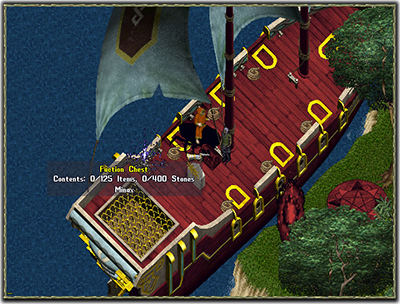 Map of Buccaneer's Den: the positions of the four Faction's Galleons and of the "Flag Altar" are highlighted. Also visible are the two Gate of entrance to the Champion Spawn, located in the basement. 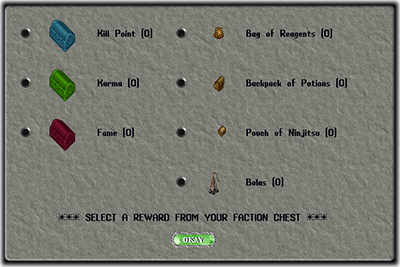 To use travel's spells such as "Recall", "Mark", "Gate Travel", etc..
A "Faction Chest", which is a special and unique case for each Faction, it has the same color of the Galleon. This case will not contain items btu the so-called "Reward Credits": once double-clicked, the case will display a gump (see image) in which it will be listed the available credits to the Faction and the rewards available for the players. All the characters that are faction members, they have the possibility to withdraw from the cash the prizes available, until the credits will run out. To prevent that the resources get picked up repeatedly by the same PGs, it won't be able for the same character to take the same each prize more than once every three and a half days. But you have to know that it has been planned a mechanics intended to encourage the most present and able players: each time that a Faction Member will kill an opponent of a different Faction, the cooldown of the winner of the clash will be reduced to half a day. Keep in mind that, on the occasion of the "Kill Point Decay" weekly, the credits present in the trunks will be reduced by 2 points, up to a minimum of 0. In order to encourage the game Player vs Player, on the island of Buccaneer's Den it will be activate a mechanism that will allow to compensate the fewer Factions in the fighting. This mechanics consists of a new method of calculation of Kill Points (or Punkte) earned "by killing" opponents: the characters of many factions they will be able to earn, on equal terms, less Punkte for each "kill". Conversely, the members of the fewer Factions will get more Punkte. Keep in mind that this mechanics expressly provides that there is no consistency guaranteed in Punkte gained or lost, so the exact amount will be determined for each kill. Remember that this method of calculation is active only on the island of Buccaneers' Den, in the rest of Felucca it will continue to apply the usual rules. In the description of Galleons Faction, we have already mentioned the "Faction Chests" and the fact that they retain the "Reward Credits" of the respective faction. To replenish the credits, you can participate to the "Capture The Flag" which will take place almost daily on the island. 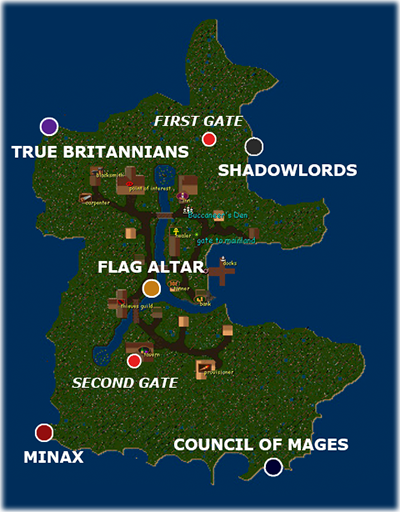 At the "Flag Altar", ", located at the center of the island at a point equidistant from the four Galleons (see map), it will be able to "spawn", once or more a day, a "Faction Flag" orange. The exact frequency of the spawn of the flag is determined by the number of characters that are faction members present on the island of Buccaneer's Den: the greater will be the number of faction members on the island, the more likely the Flag will spawn. The most favorable probability is expected in prime time, coinciding with the time of maximum influx of users. To get the flag, you must have a Faction's Thief that steal the Flag using the skill "Stealing":requirements to steal Faction Flag are the same as those for the theft of the seals (minimum level of "Stealing" 80, both hands free, etc. ), you can therefore use the same PG. Once stolen, the flag will move inside the backpack of the thief who may, double-clicking it, pass it to another Faction Member. The owner of the flag will be highlighted in game because it will take on the distinctive color of their faction. If He will try to get out from the island of Buccaneers' Den, He will magically reported at the "Flag Altar"
Finally, to encourage the participation at the event also of the characters Player vs Monster, it has been expected the presence in Buccaneer's Den of a new Champion Spawn called "Insanity Champion Spawn". The "Insanity Champion Spawn" is accessible from the basement of Buccaneer's Den by two Gates (see map). 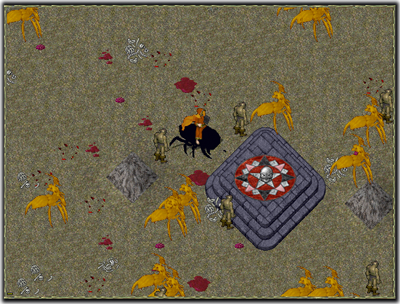 Once you will have reached the dungeon, there will remain just to challenge the Champion in the usual way ("targeting" the idol with the virtue Valor). Once defeated the "Insane Champion", you will have the chance to get as reward two new jewelry designed specifically to improve your equipment: they are two pairs of earrings that can be worn by any character, including non-faction member. 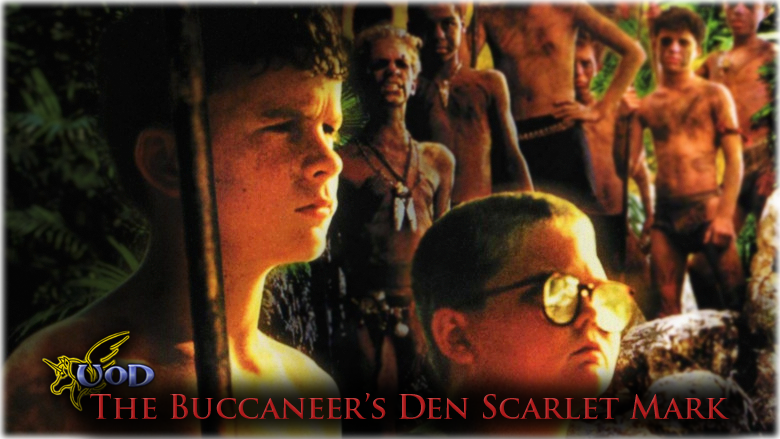 We therefore invite you all to participate strongly to the "Buccaneer’s Den Scarlet Mark" ! With the hope that the event is to your liking, we wish you a good drop and the maximum fun! Stay with UODreams!